I love the inversion. Makes him look almost made of ice or frost. Great detail in the wings. Hey, I gave this an 8! And now...6.6 is chump change for you! This is one of your best images. This is beautiful!!! The quote says it well and your image captures the essence of the quote. Very nice! Beautiful image that is certainly worth first or second place! Brilliant! worth first or second place! My goodness, this is fascinating and awesome. WHAT a shot. Excellent work, Lydia. Congrats on top 10 and your PB. Lydia, WOW! This is SO amazing! You did such an expert job making this so artful and beautiful. I think the star by this image looks very classy and appropriate. And it is a fine image to have top honors on your profile page :) CONGRATULATIONS! got your new PB! nice work and very well deserved high placement. Beautiful. Well done. Very original. Nice. I like this one. You got your personal best AND a top ten! And this is a beautiful, sad image. The words you posted with it go so well - it is amazing how detailed and somehow emotion-laden this small creature is. Congratulations! Oh, and I thought I'd commented on this before, but apparently I did not - I like how in negative it looks as though the mouth is open, though when viewed in positive it isn't. That's one of the things that makes this work so well in negative. Message edited by author 2008-04-23 03:58:52.
love the quote. when I first looked at the image it did stir me sad so i think you achieved the effect. and love the details in the wings. Congrats on your top 10 finish and new PB, this workes excellently for the challenge. Got your new PB. Well done! Great detail, this shot works perfectly in negative. Wings are BEAUTIFUL. Quite magical looking, with great detail. 10.
simply beautiful,the detail on the wings is ...just........ wow. one of my favotites! 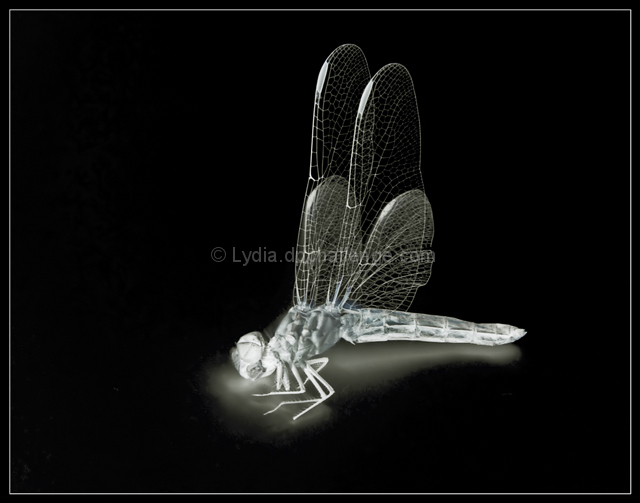 the wings are so elegent, and the dragon fly really looks like its sleeping in the moonlight! Proudly hosted by Sargasso Networks. Current Server Time: 04/20/2019 10:28:37 PM EDT.